The story begins with a normal, bumbling everyday watchdog beagle named Shoeshine who gets exposed to a substance that gives him the powers of a superhero. And not to mention the ability the speak during an accident. He is adopted by a security guard - an ex-cop, who's a widower with a 12-year-old moody son, Jack Unger. Shoeshine uses his superpower to protect his love and the citizens of Capitol City from the evil Simon Barsinister. 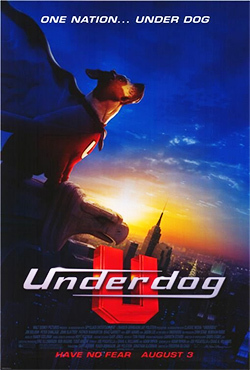 Underdog dedicates himself to good, quickly becoming revered as a superhero, but ultimately it will take the combined efforts and understanding of Underdog, Jack, Dan, Molly, and Polly to defeat Barsinister and save Capital City from destruction. viena no foršākajām komēdijām, sountraks"Underdog" arī labs.